Asrock 990FX Extreme9 – I Guess PCB handles 90C just fine. Yikes! 4x4GB AMD Performance DDR3-2133. Doesn’t know which NB speed it likes. 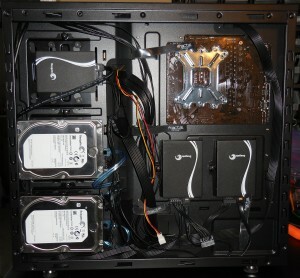 ASUS 290x Direct CUII – Destroying my the Ambient temperature. 3x Seagate 600 240GB SSD – Keeps me sane. 2x Seagate 1TB HDDS – Holds the junk I collect at LANparties. 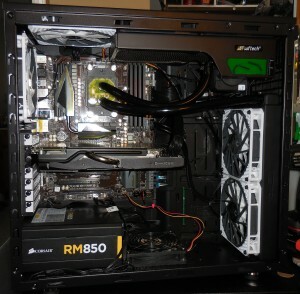 Corsair RM850 PSU – Damnit fan! Turn on already! Swiftech H240-X – Damn, how long does it take to bleed the air out! Swiftech PWM splitter <- Awesome. Load Power usage @ 4.8GHZ Ahhh to much heat comes from the my case. I cant breathe.